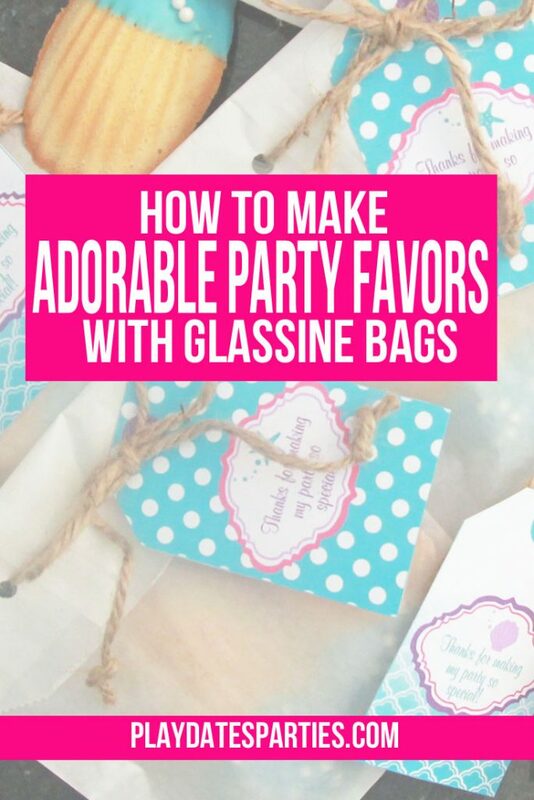 Find out how purchasing glassine party favor bags in bulk saved time and money, and how to make unique and adorable favors every time you use them. Financial gurus say that to save money, you should buy in bulk. 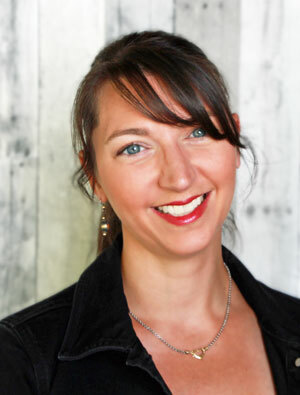 While that advice makes sense if you have the space, I hesitate to follow it when I’m not absolutely sure that I’ll use up whatever it is I’m buying. Which is why it was such a big deal that I bought a pack of 100 glassine bags for my second daughter’s 3rd birthday party. That was nearly two years ago now, and it’s one of the best party-planning decisions I made (second only to making a reusable backdrop frame). At the time, I had no idea how versatile and adorable those little bags are. And since the whole package is smaller than a ream of paper, storing the bags was no problem. After three parties, and a year and a half, we finally used up our pack of 100 glassine bags. Glassine bags are more versatile than I first expected when I bought that pack of 100. We made them look unique for three different parties, and just barely touched the surface of the possibilities. Print directly onto the bags. When it works, this is possibly the accent with the most professional looking results. However, there are numerous ways it can go wrong. Most notably for us, was that the printer ink would smudge badly during the printing process. It was also very difficult to get the image centered properly and the colors just were never very vibrant. It’s hard to admit, but nearly half that pack of 100 went to the one party we tried to do this, and there were less than 20 guests! Tie with twine (or ribbon) and a printable favor tag. I love this look for glassine bags. Hand tied bags add a special touch that is not only pretty but can also add to the theme as well. We used twine tied with nautical knots for my oldest’s mermaid-themed 6th birthday, and they were a huge hit. Print a sticker label. Sticker labels are a great option if you don’t want to tie several favor bags by hand, and want bright, vibrant colors. All you have to do is print out the label, cut it out and stick it on. Add a crafty accent. The sky’s the limit with accents. You can add stripes with different sizes and patterns of washi tape. Or get really crafty with a hot glue gun and your craft stash. 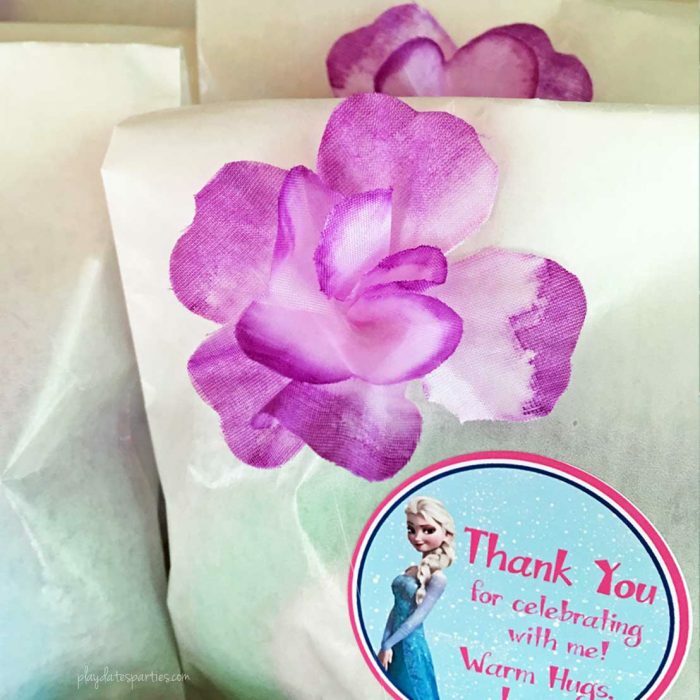 For the Frozen Luau birthday we hosted last year, a combination of sticker labels and flower accents turned these simple bags into a gorgeous display. Hot glue accents like pom poms, sequins, google eyes, or even little flowers! Just make sure to leave enough room to fold the bags over and seal them shut with a bit of washi tape. Use the scissors to cut the string of the lei and remove flower petals. Most leis come with flowers that are made from two different petal sizes. You will need one larger and one smaller petal for each flower accent. Grab one of the larger sized single flower petal layers and pinch the petals together to make a point at the center of the flower. Add a dab of hot glue to the point. Place on the glassine bag at your desired location and hold for a couple seconds until the glue has set slightly. Repeat with the smaller sized flower petal, placing it directly on top of the previous petal. Believe it or not, this was one of those last minute additions that I made the day before the birthday party. Each flower accent only took about 2 minutes to make, so our whole set of 20 favors was done in less than an hour. How Much Did the Favor Bags cost? Would I Use Glassine Bags Again? Absolutely! We ran out of glassine party favor bags last summer, but I’m already thinking about getting another set. And the flower accent was my favorite by far. Plus, we were able to use the party favor bags as decor, because they were so cute. To top it all off, they don’t take much effort to embellish, and that’s exactly what I want for all my party crafts! Even if you don’t want to dedicate much space to party supplies for your kids, these bags are so versatile, you’re sure to find plenty of ways to use them. They have a beautiful, vintage bakery style, and buying in bulk means they only cost pennies per bag. Plus, knowing your packaging size early in the party planning process makes it much easier to decide what to give as favors. They are truly win-win. Would you buy glassine bags in bulk? 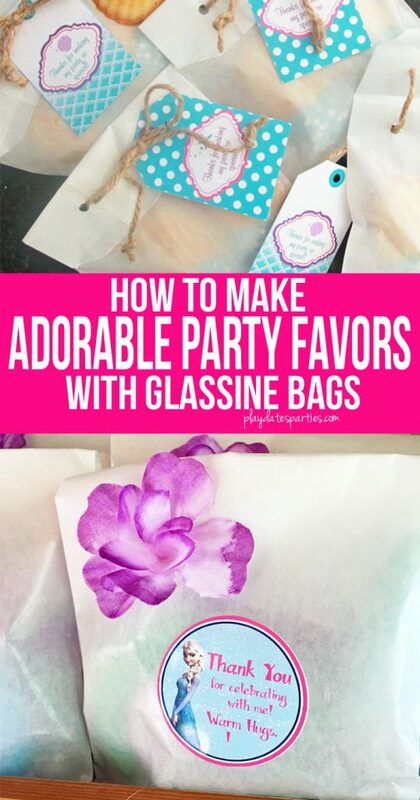 How would you decorate a set of glassine bags for your next birthday party? These are super cute! And good for you for sticking with the printing project for the first party. I probably would have thrown in the towel and just tried something else (although they looked great!). These are all adorable! I love your ideas for decorating these bags. I have some really cute washi tape but always forget to use it for anything :). Thanks for the inspiration! These are adorable! Pinned! These would be cute for any party favor. Even for adults. I am just brimming with ideas now 🙂 That is exciting! 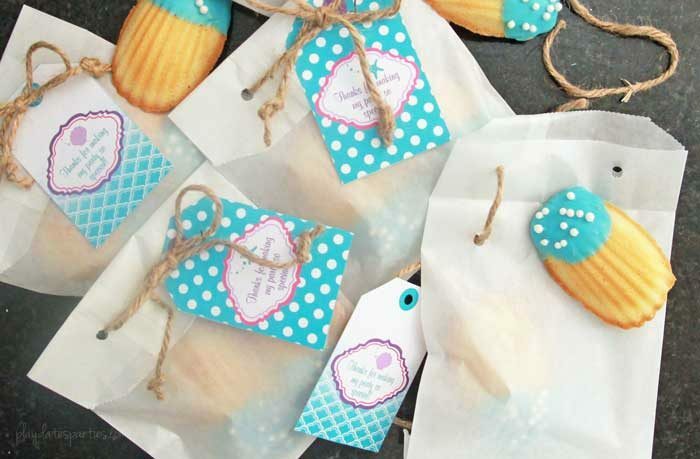 Love the idea of using these bags for favors. Just on their own they look really professional, but I like the idea of adding a sticker or a little accent like your flowers (those look awesome, by the way.) Thanks for sharing! 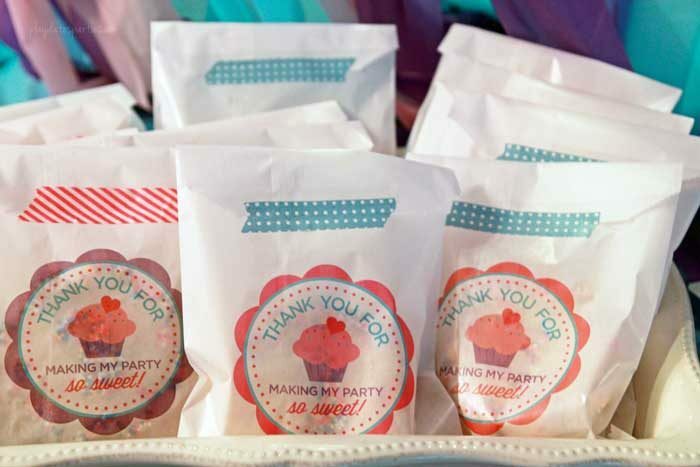 I think doing the party favors are probably my fave part of hosting a kids party! Sorry the ink didn’t work out. I feel like I’ve been there many times with various creative projects! So cute! I have printed on white and brown paper bags for my daughters class parties. It’s so fun when stuff is personalized! I love the look with the ribbon too. Thanks for sharing! So beautiful. I feel like I’m not crafty but this looks easy. Just placed my order! I agree that these would be terrific to have on hand. I like that they can work for boys and girls. Thanks for the ideas! Thank you for these great party ideas. We are having a lot of deck parties this summer and I love to have a give away for my guests. These bags and labels are perfect.